Crafford Park community is sold out and is not in active development by builder. If you are interested in Crafford Park or similar new home communities, contact us today! Our agents are very familiar with new and newer construction in Newport News, and can identify resale opportunities in Crafford Park, as well as builder inventory available in nearby or similar communities in Newport News. To view 11 more pictures, interactive maps and the full, detailed description of the Crafford Park community, please Login. 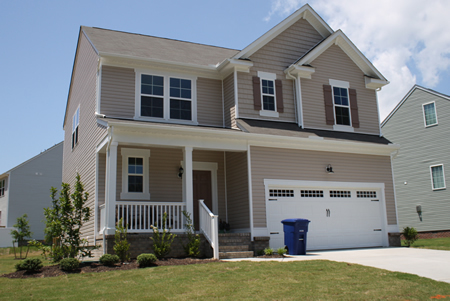 New construction homes in Crafford Park offer a rare real estate find in Hampton Roads. New homes in this development are redefining the meaning of a true home. This complex is nestled in a northern section of Newport News; convenience in the countryside. Military bases like Naval Weapons Station Yorktown and Joint Base Langley-Eustis are an easy commute while shops, banks and entertainment are even closer. New construction homes sometimes promise without delivering; not so with Crafford Park. Each of these new homes comes with exterior features including two-car garage, concrete foundation, crawl space, aluminum gutters, Bermuda sod for front and side yard, concrete patio and more. These builders make Virginia proud with the addition of this real estate development. When shopping for real estate, looking at what new construction homes offer can get confusing. Be sure to compare apples with apples though, as all that glitters is not always gold in new homes. A Crafford Park house may include a Kenmore appliance package, Moen faucets, garbage disposal, oak or beech cabinetry in kitchen and baths, exhaust fan for each bathroom, brushed nickel door hardware and nine-foot ceilings on first floor. Newport News is one of the best places to live in Virginia. Temperate climate, friendly people and fun things to do all make this a place few would want to leave. Shoppers get those credit cards ready because this is where it’s at for shopping. Peninsula Town Center has many trendy stores to check out and a Barnes and Noble to grab a cappuccino with a magazine. Then head over to City Center at Oyster Point where they have movies, restaurants, upscale shopping and even special events. Who knew rural life could offer so much? Well, it can when you live in one of the new homes of Crafford Park. This new construction is not just offering real estate; it’s offering the best of both worlds in a terrific location. Send me more information about communities similar to Crafford Park. Our agents gladly offer FREE property tours of Crafford Park, Newport News and homebuyer consultations to all serious buyers.